Composite fillings are made from a durable combination of plastics and glass that match the color of your natural teeth. Rather than the black or silver appearance of other materials, these tooth-colored filling are less noticeable, offering cosmetic as well as practical benefit when repairing cavities. Placing a composite filling consists of applying layers of the resin over the prepared area. Each layer is hardened or “cured” with a special light. Once the filling is complete, your dentist will shape and polish the filling to match the appearance of your natural tooth. Because the material bonds with your teeth, less preparation is needed and less tooth material needs to be removed before placing the filling. 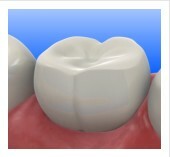 The tooth structure is reinforced and there is insulation from hot and cold sensations. Tooth-colored fillings are fully compatible with sealants, making it possible to both repair the damage of tooth decay and ward off future problems in the same appointment. In the event of any type of damage to the filling, they can usually be repaired with the addition of more composite material. Composite fillings are the preferred option for fillings that would be easily visible to others, particularly in the front teeth. They do not contain metal and do not carry the risk of causing allergic reactions or other unpleasant side effects associated with silver amalgam fillings. While they are durable in small cavities, they can wear out more quickly than other materials in larger fillings and are not recommended in high-pressure areas. To learn if composite fillings are right for you, schedule an appointment at Briter Dental today.